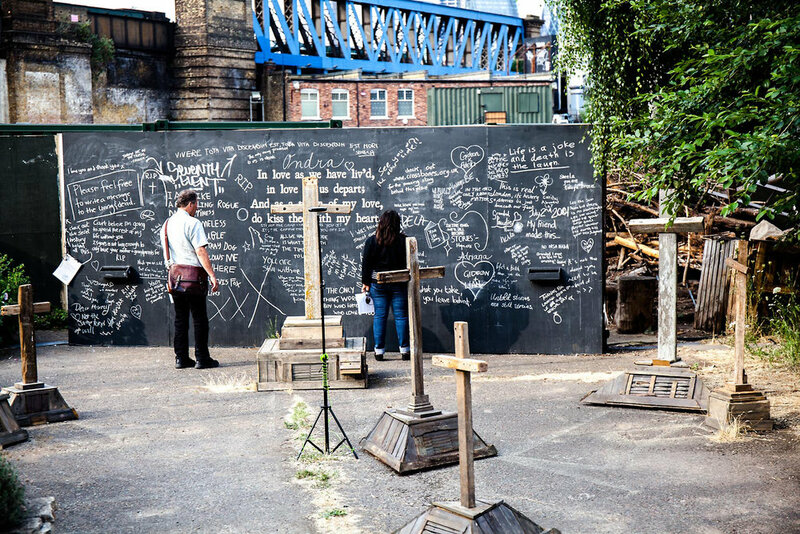 Requiem for Crossbones, on the site of an un-consecrated post-medieval burial ground, was an evocative site-specific sound installation created and composed by British artist Emily Peasgood specially for MERGE Bankside. The piece sensed movement and responded to its audience, triggering a soundscape which acted as an interpretation of the lives once lived and laid to rest at the site. Requiem for Crossbones was an act of remembrance; a communal reflection on history, inequality and acceptance. 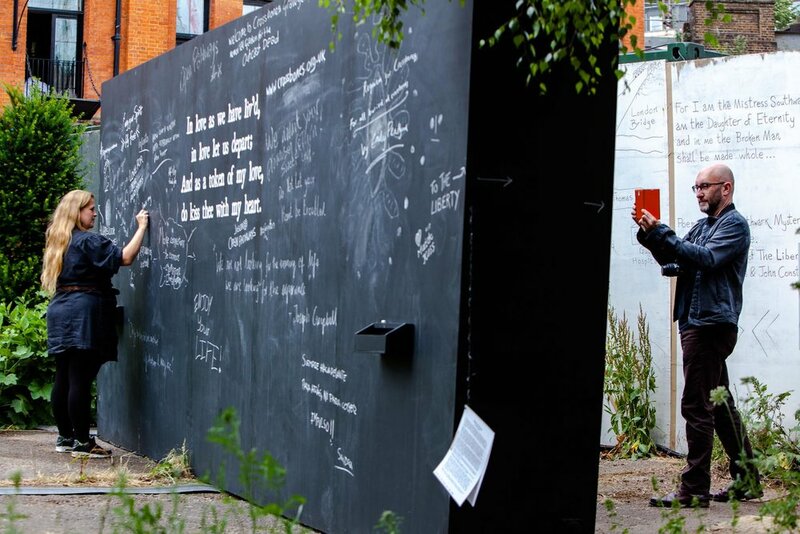 It encouraged participation and gave visitors the space to reflect on personal loss. The work comprised of five melodies, each creating individual narratives that told the story of Crossbones and come together to form a whole soundscape. Peasgood also drew plots on the ground to acknowledge those lost, and a memorial board which encouraged visitors to leave messages for the lost or living. Bankside was once a notoriously lawless part of London, a rowdy pleasure quarter outside of the city walls and its jurisdictions. Home to theatres, brothels and gambling dens, it was a place where the outcast resided. 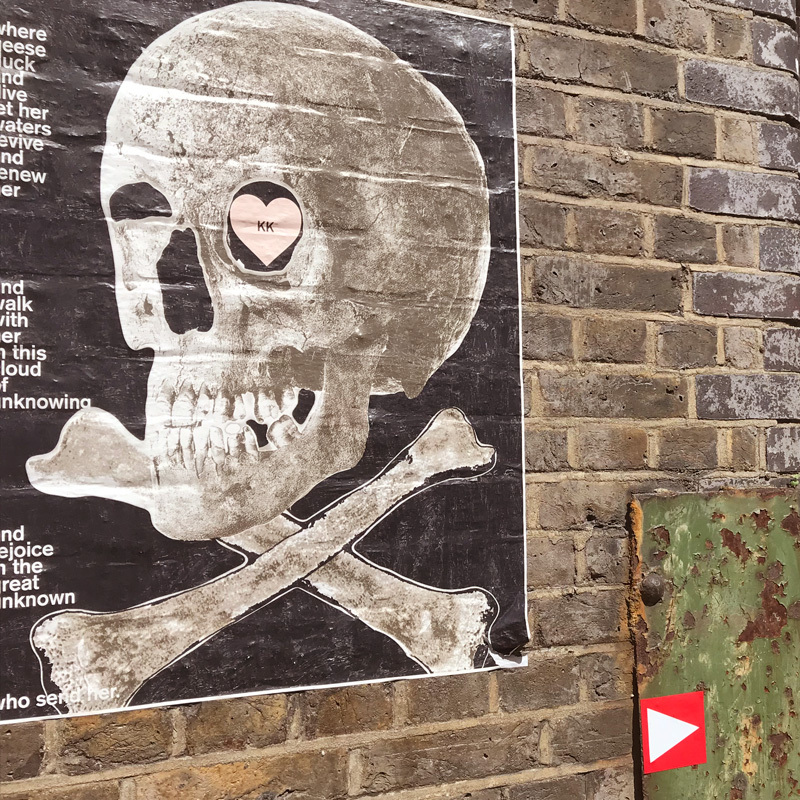 Established as early as the 17th century, Crossbones, is believed to be the final resting place for prostitutes, known as ‘Winchester Geese’, paupers, criminals and children - those who could not afford burial or were deemed unfit for burial in consecrated ground. In excavation work carried out in 1992, a majority of bodies exhumed were children. As such, Peasgood placed emphasis on the children and babies laid to rest at Crossbones. As part of Uniqlo Tate Lates programme Peasgood discussed her installation and working with history and communities. Commissioned by Illuminate Productions and Better Bankside Produced by Illuminate Productions, in partnership with Bankside Open Spaces Trust (BOST) and Tate Modern. Key coverage total reach 35 million. Media included: BBC Radio London Robert Elms, The Evening Standard, Time Out, The Londonist, Metro, FAD, Weekender, London Calling, Lambeth Life and InSE1. 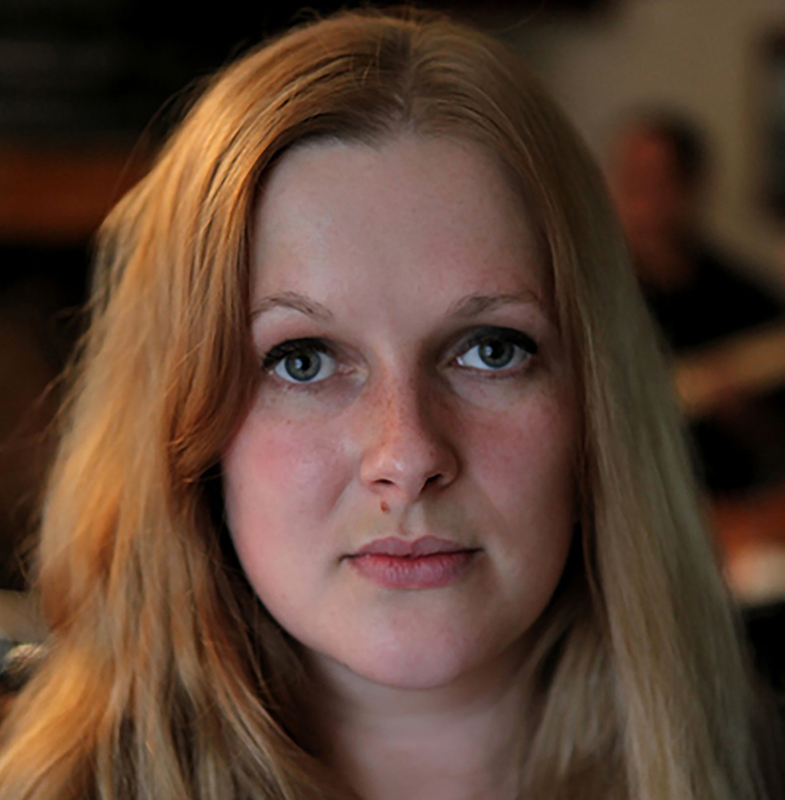 Emily Peasgood is an award-winning composer, sound artist and visual artist. She creates research-led, multi-disciplinary work for galleries and public spaces, ranging from large-scale community events to intimate sound installations. Her work explores current affairs, community, and connecting people with overlooked or forgotten places. Her work is described as ‘magical’ (The Times), ‘evocative’ (The Telegraph), and ‘memorable’ (A-N). Recent works include: The Illusion of Conscious Thought (Funicular lifts, Hastings 2018), Sea Folk Sing (2018), Halfway to Heaven (Folkestone Triennial 2017), LIFTED (Turner Contemporary & South Bank Centre, 2016), and BASCA nominated works Crossing Over (2016) and BIRDS and other Stories (2017). Halfway to Heaven, commissioned for Folkestone Triennial 2017. The site of a post medieval burial ground estimated to hold the mortal remains of 15,000 women, children and men who lived, worked and died in what was once an impoverished and notoriously lawless part of London. The history of the place is not confined to some distant past; it’s an ongoing work in progress. 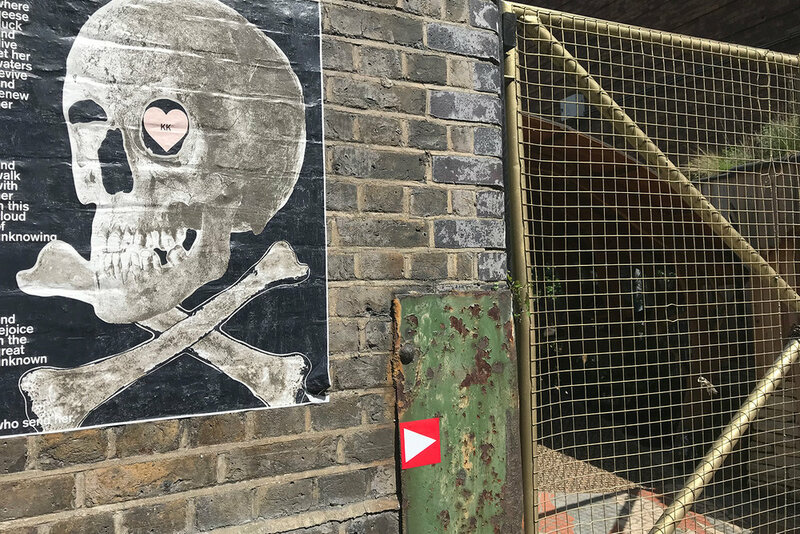 Since 1996, Friends of Crossbones have worked to protect the site and to raise awareness of its historical, cultural and spiritual significance. In 2014 Transport for London granted a lease to Bankside Open Spaces Trust to create a community garden. 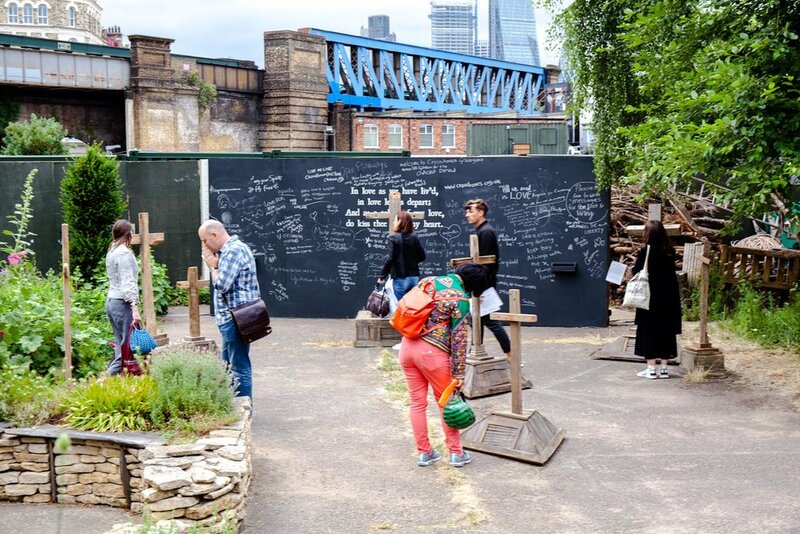 Since then, Friends of Crossbones have collaborated with Bankside Open Spaces Trust to create a public Garden of Remembrance.